You may or may not know, I love lighting solutions. The amount of different flashlights I own is borderline shameful. Who am I kidding it’s awesome! 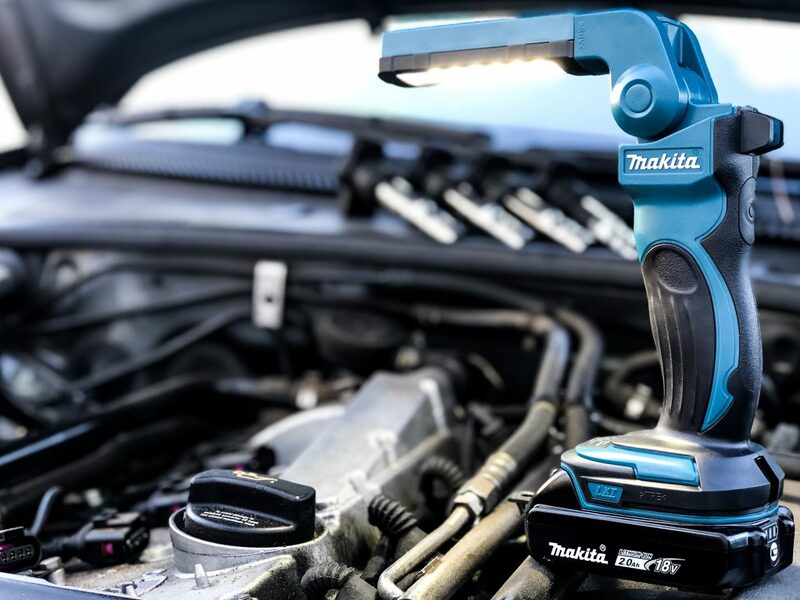 Today we are looking at the Makita Cordless 12 LED Flashlight! Also paired with 18v 2.0AH Battery and Charger Starter Pack if you need batteries and a charger. When it comes to lighting today, LED technology gives us amazing output in a small space. This light will put out 240 lumens from 12LEDs. You can also dim it down to 120 lumens if the situation requires it. People often forget how much better good lighting can make a job. It’s not as fun working on a project when you can’t see what you are doing. One great thing about making Youtube videos, you learn really fast about good lighting. I love that we have so many different lighting options today. This light reminds me a lot of the first inspection light I ever bought. The options you have with how you set this light up are almost endless. As you see above, it’s nicely balanced on the intake manifold of my Passat. It stayed nicely right there while I was removing the spark plugs. It’s also great that the LED head rotates and folds to help get the light were you want it. So if you are working under the hood, or under the dash, you can probably get the light right where you need it. Because the LED head folds, and rotates, you get tons of options. Now the light broadcasts rather wide. This can be a good thing if you are inspecting a larger area. Sometimes the issue you are looking for lives just beyond the drop off of light when using a pen light. 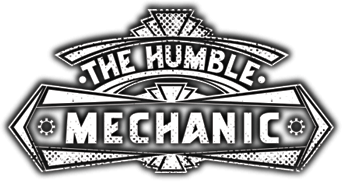 This also means you can rest it on something, like the engine bay, use it as a hand held, or use the hook to hang the light from something like a coilover. Overall this is a cool light to have. It wouldn’t replace my pocket light, but makes a great inspection light. 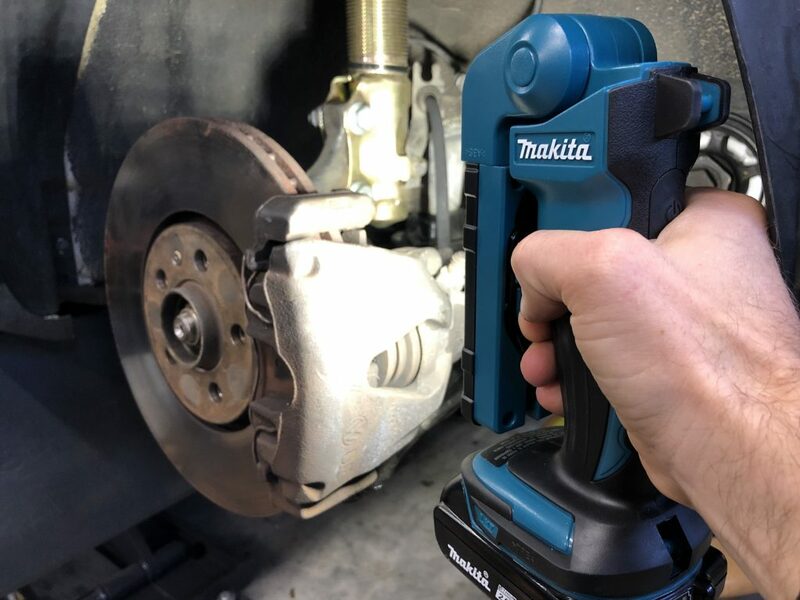 I would say if you are running Makita 18v tools it can be a great addition to the box. If you had to buy the light and the batteries, you are spending a lot of money on one light. That being said, it could be a gateway to getting on the Makita platform. When it comes to buying any battery power tools, I try to consider the tool I am interested in, as well as some of the other tools available on the platform. And of course it’s always recommended to head to the local Home Depot aka HomeDepot Motorsports and put the tool in your hands as see if it fits your needs. This looks like a solid bit of kit! We might have to look at getting one of these! Epic review!